The above figures show the standing waves of the conduction electrons in the iridium nanowires. In the nanowire of 4.8 nm (left picture) the half wavelength fits precisely, while the entire wavelength fits in the nanowire of 9.6 nm (right picture). Nano technologists at the University of Twente research institute MESA+ have, for the first time, demonstrated quantum effects in tiny nanowires of iridium atoms. These effects, which occur at room temperature, are responsible for ensuring that the wires are almost always 4.8 nanometers—or multiples thereof—long. They only found the effects when they failed to create long nanowires of iridium. Nature Communications is publishing the research today. There is an increasing interest in metallic nanowires within the scientific community. This is partly because they are extremely useful as part of (nano-) electronics and partly because nanowires lend themselves to achieving more insight into the exotic and unique physical properties of one-dimensional systems. In 2003, UT researcher, Prof. Harold Zandvliet and his research group, had already succeeded—using self-assembly—in creating nanowires of platinum atoms on a surface. Because gold and iridium are both closely related to platinum, nanowires of these materials were the following logical steps. The researchers managed to create long threads with gold, but when they recently wanted to repeat the trick with iridium, it appeared that the wire lengths occurred only in units of 4.8 nanometers. Experiment failed, you might think, but that is not the case. Further examination of the nanowires formed produced namely a surprising discovery: nearly all the wires that were formed had a length of 4.8 nanometers, or multiples thereof, and they nearly all contained twelve iridium atoms, or a multiple thereof. The researchers found the explanation for this in quantum effects. The wires of 4.8 nanometers (or multiples thereof) appear to be electronically stabilized by conduction electrons whose (half) wavelength (or a multiple thereof) fits precisely in the nanowire. The existence of these standing electron waves in the nanowires could be demonstrated experimentally. As this stabilizing effect will not occur in nanowires of iridium of a different length, they are formed more slowly. What makes quantum effects in the nanowires even more interesting is that they occur at room temperature, while many quantum effects appear only at extremely low temperatures. 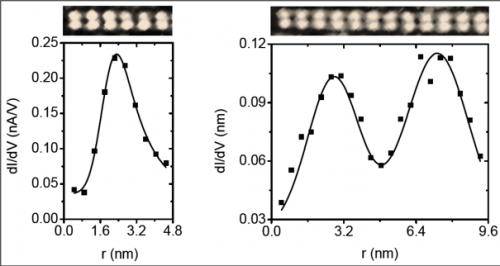 The article is titled "Electronically Stabilized Nanowire Growth."